Cars are cool, but flying cars are the stuff of our sci-fi dreams and now one company is making it a reality. Sadly, it is not in any way based on a DeLorean nor does it require a Mr. Fusion for power, but it’s still nothing short of incredible. Slovakian company AeroMobil has already shown prototypes of their Flying Roadster, but now they’re set to give the latest version of their vehicle an official debut on October 29th at the Vienna Pioneers Festival. This isn’t just a one-off that looks neat and does the job with zero potential for actually appearing on the road. They fully expect to be selling this to us regular folk by 2016. 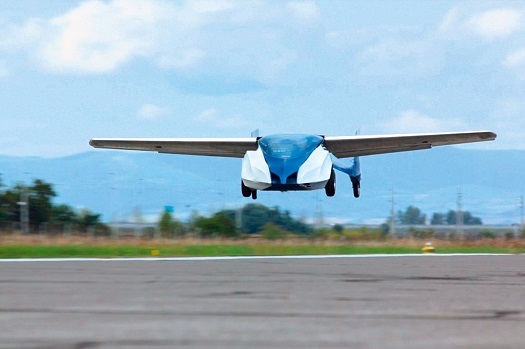 It starts with two collapsible carbon-fiber wings that fold in tight along the vehicle’s body when it’s not in flight. The AeroMobil looks just like a fancy supercar when it’s driving down the road. There’s a simple button that switches modes from driving to flying and all the driver – pilot?- needs is a grassy field with at least 200 meters of space to gain speed. Once the vehicle hits 130 kph it will take off and we’re all headed back to the future, or at least around that pesky traffic jam packed tight with less well-equipped cars. The whole thing weighs just 450kg and is powered by a 100hp, light-aircraft-standard Rotax 912 engine that does the job in both flying and driving modes. This is an idea that CEO Štefan Klein started working on 25 years ago, before the Velvet Revolution, at a time when a flying car seemed like a perfect means of escaping to Western Europe. The two-seater is probably pretty well-equipped for that kind of run, since it’s definitely not an SUV that will be hauling the family. Think of this as that sports car that you pull out of your garage on sunny summer days. Sure, you might not be able to use it as an everyday driver, but it’s so much fun on the days you do drive that you just don’t care.